What was social Darwinism? And what was its relationship to Darwin’s theory? The term was first used in 1877 in, of all places, a book titled The History of Landholding in Ireland. Between that first coining in 1877 and Montan’s opinion piece in 1918, it experienced an evolution of its own. The label was affixed to innumerable thinkers, many of whom rejected it.In its essence the term represents a complex set of social theories with one essential feature: the belief that the competition for resources Darwin described happening in the natural world can explain how human societies develop. The farther history moved from the publication of Darwin’s chief works, the more his work merged in the public mind with the work of others. By 1918 it was not surprising that the good reverend would equate Darwin himself with the way social Darwinists had developed their theories. But social Darwinism was much more complex than Darwin’s theory alone. Under this wide umbrella were thinkers as diverse as Karl Marx and Benjamin Kidd. The former described religion as the opiate of the people; the latter claimed religion was one of the highest achievements of society. Some who held these ideas predated or were contemporaries of Darwin. And some later thinkers used natural selection to justify the most horrific atrocities of the twentieth century. However no one ever claimed to be a social Darwinist. Instead the term was used as an insult by social theorists against the views of their opponents. In 1838 Charles Darwin read An Essay on the Principle of Population by Robert Malthus, a British scholar and minister. Written in the waning years of the eighteenth century, the essay argued that, if population grew unchecked, it would inevitably outgrow society’s ability to produce enough food to sustain itself. Darwin took this idea of a struggle for survival in the context of limited resources and applied it to biology. This spark helped ignite his theory of natural selection. Malthus died 25 years before Origin of Species was published, but his work was a precursor to what was called “social Darwinism.” He was often lampooned for the apparent hard line his theory took. Britain’s poor laws should be repealed, he argued, because they weakened the poor and enfeebled society as a whole. It is said that Charles Dickens had Malthus in mind when he imagined Ebenezer Scrooge in A Christmas Carol—though to be fair, Malthus complained only of public funds being used to uplift the poor; he supported private charity. Another precursor, Herbert Spencer (1820–1903), wrote about biological evolution before Charles Darwin did. After reading Origin of Species, he coined the term “survival of the fittest” in his Principles of Biology (1864). Darwin liked the term so well he used it in the fifth edition of Origin, and it became popular shorthand for Darwin’s theory. Much like Malthus, Spencer believed that helping the poor interfered with natural selection. People needed to compete for resources if society was to advance. Unlike Malthus, though, he had a sense of optimism about the future of the human race. Taking the theory of natural selection and applying it to a broader context, evolutionary theory was often used to justify existing class structures and, quite often, the subjugation of other races. The most pressing social issue of Darwin’s day was the abolishment of slavery. Some of his scientific motivation came from a desire to prove the common ancestry of man and give the abolitionist argument a sound scientific foundation. But for many other scholars, especially those already inclined to support slavery, the principle of “survival of the fittest” meant that those weak enough to be enslaved were not fit for survival. One Southern essayist, Louisa McCord, suggested that slavery was a blessing from God instituted to protect inferior Africans from the fate of Native Americans, who were destined for extinction. In a competition for resources, they were fated to lose. When Swiss scientist Louis Agassiz first encountered African Americans in Philadelphia in 1846, he was so viscerally shocked that he simply could not accept the idea that he shared with them common ancestors. Their lot inspired compassion in me in thinking that they were really men. Nonetheless, it is impossible for me to repress the feeling that they are not of the same blood as us. . . . What unhappiness for the white race to have tied their existence so closely with that of Negroes in certain countries! God preserve us from such a contact. While he continued to maintain the spiritual equality of all men before God, he endorsed a scientific theory called “polygenism,” the idea that God created the different races at different times in different parts of the world. 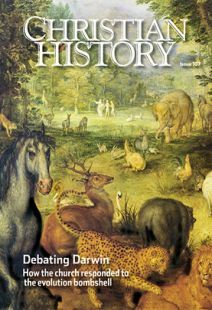 Rejecting Darwin’s theory of evolution as materialism, his own theory sought both scientifically and philosophically to reconcile the fossil record with a theory of creation. This kind of thinking goaded Darwin on as he published The Descent of Man—a sequel, of sorts, to Origin of Species. In this application of evolutionary theory to human origins, Darwin argued for a single ancestor for all the races. He saw Agassiz’s racial theories as flawed and irrational. Was Darwin a social Darwinist? Darwin never applied his theory of natural selection to society in a comprehensive manner, though he came close in several of his works. In 1883 Darwin’s half-cousin, Francis Galton, took the theory to the next level. His book, Inquiries into Human Faculty and Its Development, coined the term eugenics (from the Greek for “well born”), a philosophy stating that those with favorable characteristics should be encouraged to marry and have children, while the weak and infirm should be discouraged from repro- ducing. Galton saw in his cousin’s theory a tool that could be used to improve the quality of society. Matt Forster is a freelance writer and editor from Clarkston, Michigan. How often did the encounter with Darwinism cause a spiritual crisis?